If you are an Academy member, do not create a new account. All Academy members currently have an eAudiology account that is based on member ID and email address. To login, use the email address associated with your account and your member ID as your login. 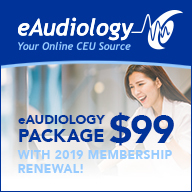 If you need your member ID, please email continuingeducation@audiology.org.